Gradual Disengagement: A Portrait of the 2008-09 Dropouts in the Baltimore City Schools examined eight years of student-level data to paint a collective portrait of the process of disengagement that leads to student dropout. The study found that the majority of students who eventually drop out of Baltimore high schools enter ninth grade with a pattern of chronic absenteeism that goes back at least several years. 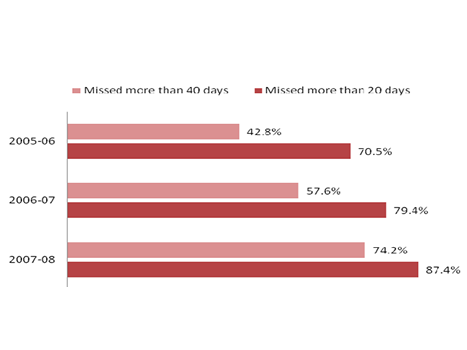 A large majority of eventual dropouts are overage for grade by the time they enter ninth grade for the first time, and have increasingly high levels of absenteeism and course failure over their years in high school. The study recommends that interventions be implemented during the early middle grades to prevent most dropout outcomes, and that non-traditional credit-earning options be offered to older enrolled students (17 and older) who already have patterns of chronic absenteeism and course failure. Click here for Gradual Disengagement: A Portrait of the 2008-09 Dropouts in the Baltimore City Schools.